Sefton Council has been spreading the message that the borough is open for business and ready for the future. As part of a jam-packed calendar of commerce friendly events, local businesses, start-ups and budding entrepreneurs benefitted from the insight of thought leaders, successful peers from the world of business, key organisations as well signposting to funding and support to help make their ventures a success. Organised by Invest Sefton, the enterprise, business support and inward investment arm of Sefton Council, the Sefton Economic Forum (June 8) and the Business Start Up Conference (June 20) enjoyed big turnouts during a very busy period for Invest Sefton, including the International Business Festival and the Liverpool City Region Skills Show. The Economic Forum gave local businesses and residents the opportunity to enjoy talks from and a Q&A session with key speakers, including respected sports journalist Tony Evans; Robin Tudor from Liverpool John Lennon Airport; Rob Capleton from Liverpool International Business Festival and Head of Commissioning at Sefton Council, Peter Moore. Organised in partnership between Invest Sefton, The Enterprise Hub and Kevin Murphy, Managing Director of host Venue Rent a Space, the Start-ups Conference saw budding entrepreneurs flock to the Bootle venue as over 50 would be business owners enjoyed “A Taste of Business”. Hosted and curated by Kevin, a passionate advocate of local business, the event was open to anyone thinking of starting a new business or at the early stages of their new enterprise. Attendees heard from Invest Sefton and The Women’s Organisation about the support available to them, as well as real world anecdotes and advice from businesses based at Rent a Space, including family run business Perfect Samosa, Workout Liverpool fitness gym and fashion designer Alex Meade. 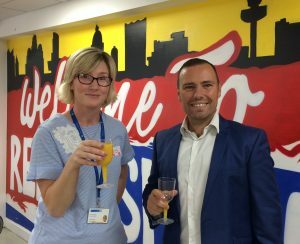 “Sefton really is open for business and hungry to do business, as the fantastic turnout for the Economic Forum and start-ups conference demonstrated, although the three Ps of pizza, prosecco and Peroni lager may have helped! “In all seriousness, the Council is working tirelessly to make Sefton a place where businesses want to grow and invest, bringing jobs and prosperity to our communities. Events such as those hosted by Invest Sefton are vital part of the local authority’s role of facilitator for economic growth as we work towards our vision for the borough in 2030.